Lewis McManus (stripes) scored for Bretton North End against Whittlesey Athletic B. 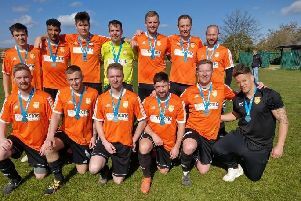 A title win, a promotion to the Premier Division and relegation issues were confirmed in last night’s (April 25) Peterborough League action. Uppingham Town’s 2-0 home defeat at the hands of Ketton means they will go down from the Premier Division, but Thorney, who didn’t play, are now safe. Harley Williams (stripes) scored for ICA Sports at Stilton. It’s a fine achievement by Thorney who lost their first 13 matches of the season when they stood on -1 point! Stilton United’s 3-2 home defeat by ICA Sports means they just sweat over survival for another game at least. Crowland can still overhaul them by winning both of their final two games, although a point for Stilton from their final game against Ketton would ensure they stay up. Moulton Harrox Reserves didn’t play last night, but were confirmed as Division One champions by second-placed Warboys Town’s 2-2 draw with Whittlesey Athletic Reserves. That result was good enough for Warboys to seal a top three spot which should lead to promotion to the top flight as Moulton cannot be promoted because of the presence of their first team in the Premier Division. Tom Flatters bagged a hat-trick for Bretton North End against Whittlesey Athletic B.
Sutton Bridge United are a point (from two games) away from joining them after a 2-1 success over Long Sutton Athletic last night. Tom Mann and James Betts scored the goals for Ketton. Josh Smith (2) and Harley Williams were the men on target for ICA Sports. Dan Moulds scored both goals for Warboys. Bretton North End are in control of the Division Three title race after a 12-0 duffing of Whittlesey Athletic B last night. Jamie Graham (5), Tom Flatters (3), Lewis McManus, Harry Woodward. Jordan Fiddes and an own goal made it 20 wins in a row in all competitions for Bretton. The Premier Division title race continues tonight (April 26) with leaders Peterborough Sports Reserves travelling to AFC Stanground Sports and second-placed Pinchbeck United off to Deeping Rangers Reserves. There’s a four point gap between the two with six matches each to play. Moulton Harrox moved up to third with a 4-2 win at Holbeach United Reserves last night. Netherton United will return to third with a win over Sawtry at the Grange tonight. The city side won 3-0 at Sawtry last Saturday (April 22). The top two in Division Two clash tonight when Ramsey host Whittlesey Athletic A.
Premiair will clinch the Division Four title with a win over Parkside tonight. That would be back-to-back titles for a team who played under the Limetree UTR banner in Division Five last season. Holbeach United Reserves 2 (Ford, Shepherd), Moulton Harrox 4 (Maddison 2, Lambe-Hyner, Allen). Uppingham Town 0, Ketton 2 (Mann, Betts). Whittlesey Athletic B 0, Bretton North End 12 (Graham 5, Flatters 3, McManus, Woodward, Fiddes, og). Premier Division: AFC Stanground Sports v Peterborough Sports Res, Langtoft United v Thorney, Deeping Rangers Res v Pinchbeck United, Netherton United v Sawtry. Division Two: Ramsey Town v Whittlesey Athletic ‘A’. Division Four: Long Sutton Athletic Res v Tydd St Mary Res, Premiair v Parkside.